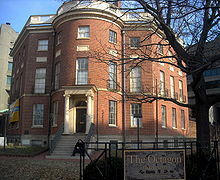 The Octagon house, Downtown Washington D.C. The Octagon house was built in 1801 by Colonel John Tayloe III. The Tayloes were a greatly distinguished Virginia family: His grandfather, Colonel John Tayloe, was a member of the King's Council in Virginia and owner of more than 3,000 acres of land (a huge estate at the time), and his father, Colonel John Tayloe II, built the historic Mount Airy manor house in 1758 and was also a member of the King's Council. John Tayloe III was a close friend of George Washington's, and Washington convinced Tayloe to build a winter home in the new city of Washington. There is some evidence that walled back yard of The Octagon itself may have served as a slave market and it is well-established that the rear of the building housed the Tayloe family's slaves. It is said that the octagon house may be the most haunted house in D.C. Apparitions and the presence of otherworldly forces have been seen and felt in many places at The Octagon, including on the spiral staircase, the second floor landing, the third floor landing, the third floor bedroom, and the garden area in the rear. Among the eyewitnesses have been members of the public and curators and other employees hired by the museum which owns the house. Two of Colonel Tayloe's daughters are said to haunt The Octagon. The first allegedly died before the War of 1812. Colonel Tayloe and his daughter quarreled on the second floor landing over the girl's relationship with a British officer stationed in the city. When the daughter turned in anger to go down the stairs, she fell down the stairs (or over the railing; stories differ) and died. Her specter is alleged to be seen crumpled at the bottom of the steps or on the stairs near the second floor landing, and sometimes exhibits itself as the light of a candle moving up the staircase. The other main ghost includes that of Colonel Tayloe's other daughter who eloped with a young man, incurring her father's wrath. When she returned home to reconcile with her father, they argued on the third floor landing. This daughter, too, fell to her death down the stairs (or over the railing), and her shade is alleged to haunt the third floor landing and stairs between the second and third floors. The Octagon is also believed by some to be haunted by the spirits of African American slaves who once lived there. When the house held bells to summon servants, the spirits of the dead slaves would announce their presence by ringing these bells loudly.